We were invited to play the FC United end of season party / treasure hunt, which also coincided with the Looking For Eric release. Playing an early evening post-punk set in a jazz club, with a sea of moody, black-jacketed characters wearing Eric Cantona masks staring back at me was an unusual one, but an enjoyable gig all the same. Revue, an excellent new night at Centro, asked us to play their debut gig, and we played an acoustic set. Revue is a free night which always hosts some of the best acts around, in Manchester’s Northern Quarter. Worth checking out. After the shenanigans of 2008, Dan, Neil and Lucy headed back to Mid-Wales for The Square Festival. Matt was away this year, so we were not playing, but went to have a bit of a holiday instead. Flu of the Swine had already claimed one of our party before setting off, but that just meant more room for beer in the car. Problem was, the car wouldn’t leave the Asda car park. Lucy ordered me to buy some in-car hair straightners (this is actually true) to buy time, so that the engine could cool for Dan to unscrew some bolt or other. Car fixed, hair strightened, beer opened, we set off. We saw the Bison Ranch, lots of sheep at 70′ gradients, and were definitely at loggerheads at one point. Then Cardigan Bay rolled into view. The weather and the scenery, like last year, were amazing. The policy of ‘4 cans only to be taken into the campsite’ was equally amazing, but not in a good way. A daft game of going in and out of the campsite began, until even the stewards got bored and we got all the booze in. Tents up, ’twas time for Supergrass. Good set. I’d forgotten how many good songs they have, and forgotten about ‘Mary’ completely. Sunday saw lots of lying out in the Sun, drinking Cider, playing the guitars, and watching some kids claiming they’d just taken shitloads of Ketamin, whilst running round like 5-year olds on a sugar/lemonade rush. Er, they hadn’t. Sunday’s washout meant that only one man could brighten the day. Step forward Mr Gideon Conn. In no time the atmosphere changed from wet, cold, miserable to holiday time again, thanks to Conn, Josephine Oniyama and band. Hats off, Sirs. The Joy Formmidable were also excellent. We dried off in the pub for an hour or three (cheeky phone charge as well), although the Sunday night kareoke by the locals was less then impressive. Next stop – gig in a takeaway: Challenged by new friends to play a song in the street, Neil and Dan were ushered into a takeaway. Right in, in fact. Through the door, behind the counter, through the back and into the garden around a huge campfire! Here’s a photo. We took the party back to the campsite (‘We’re by the tent that looks like a cow’, ‘eh?! ?’), drank a lot (of various concoctions) and Dan+Neil played some Acoustic Wallace, long-forgotten classics and a nice version of Helicopter with help from the ‘Bloc Party Choir’. After an absinthe breakfast, and sharing the wealth of apples and their healing powers with our new friends, we said our goodbyes (until Square 2010) and made the now-customary trip to the beach – Lucy went for a swim as Neil played and sang Mansun’s first album from start to finish. A quick stop off for a Bison Burger and we were home for a shower and some sleep. Revue invited us back to play their InTheCity showcase, as a full band this time. Once again, a good gig ensued, with another great line-up of acts. Even more pleasing was the artists’ food rider and chocolate brownies. Yes please. 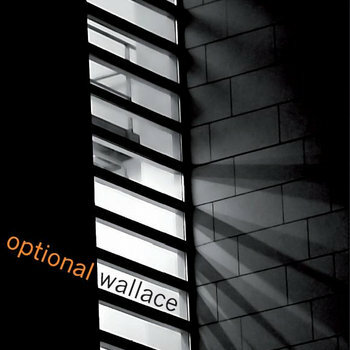 In November, Swampy asked Optional Wallace to play at his birthday do, in a (fittingly, some might / should say) brewery. Dan and Neil had played an acoustic set here in the summer, but brought Matt (and no fewer than THREE PA systems) along to do a full set. The largely Man Utd crowd lapped it up, so much so that Dan kept playing and playing until well into the next morning… Three Rivers – we salute you. Fanzine ‘United We Stand’ has put us top of their Top 5 Bands To Watch Out For in 2010, and we hope to reward their faith in us.